How about a guide to buying our latest obsession we hear you yodle? 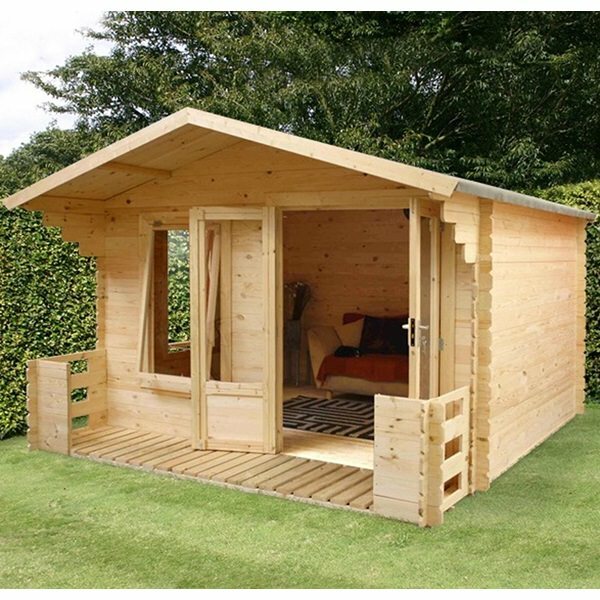 Well yodle no more, for the first and (as at this date) only guide to buying your own Log Cabin is just a stick flick away. 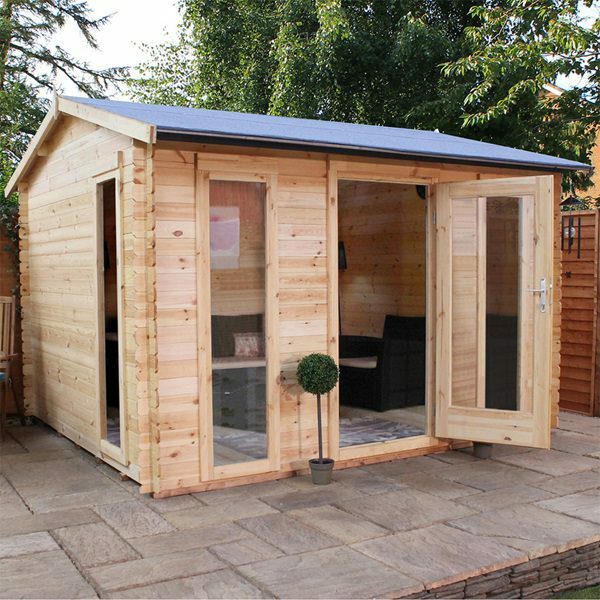 Our smaller log cabins start at around 2.5m x 2m, heading up to the 3.5m x 3m mark for the width and length of a mid size one. 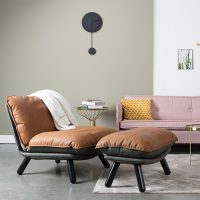 Often, each model of the range is available in one of two or even three sizes, depending on what you really think will fit the snuggest. 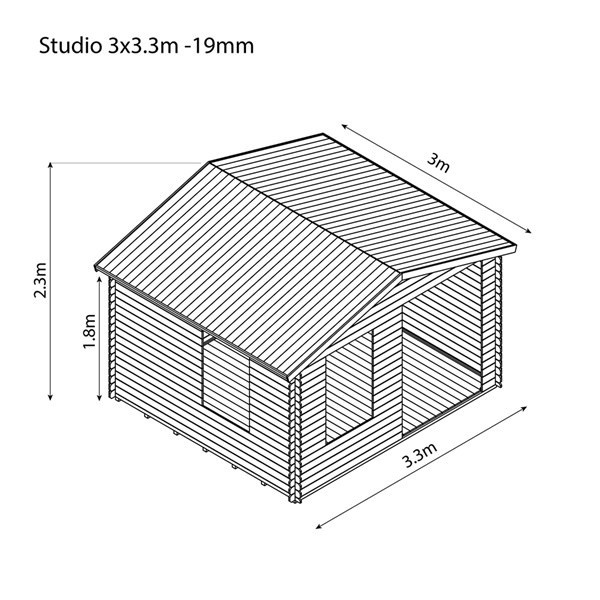 The Studio Log Cabin, for instance, ascends from the bottom end of our dimensionality to 2.6m x 3.3m and even 3.3m x 3m builds – a great size for the average garden. 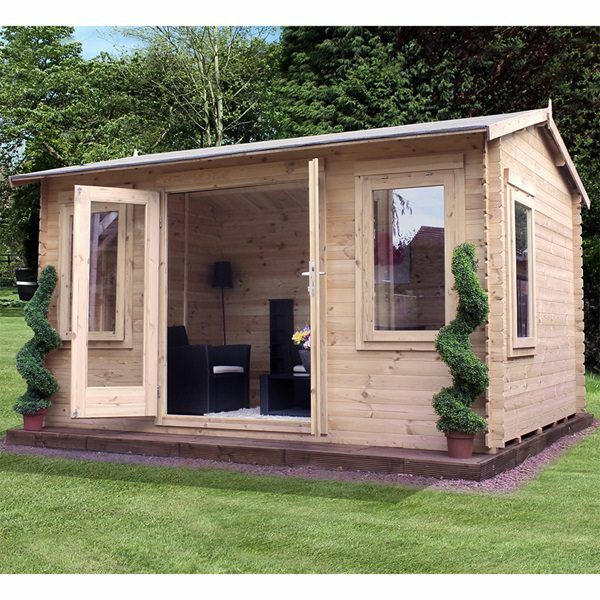 On the other hand, if you can accommodate it, we have log cabins stretching to 5m x 4m. It depends also on what the cabin will be used for: is it going to be a hangout spot for the kids, or more of a second, breakaway party lounge for adult friends? 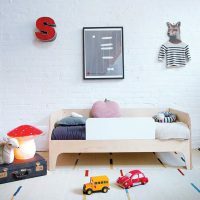 The larger the ideal crowd, the bigger your purchase may become, as you never want to have a cramped furniture arrangement inside. Now onto the shapeliness and functionality of doors and roofs, which are paramount to the look, use and open-spaced feel of your cabin. It’s important to hone in on what you prefer: choose the right features, and they’ll complete your sense of a fantastic, satisfying investment. Let’s tackle the top of your log cabin first, as it could decide where the unit ends up in your backyard. 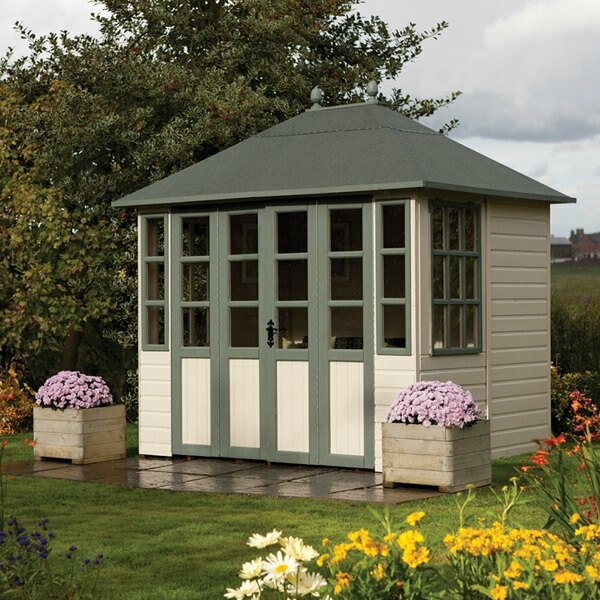 We have flat-roofed variants like the Delamere Cabin, which doesn’t intrude on any branches or thick bushes overhead. Ideally, you want to save your new home from being whacked by a tree on a windy day. These roofs make the cabin squatter (shorter in height) and more contemporary looking although the downside is that they will accumulate leaves, dirt and twigs if there is a floral feature above them. Bear this in mind if you plan to always strive to keep the cabin in great shape. For picturesque priorities, we suggest any of the pointed rooftops on offer. They bring a certain storybook impression to your outdoor space, almost like a Wendy house, but with ultra-smart presentation skills. Unlike flat roofs, they’ll direct any debris to either side of it, meaning you haven’t got to climb up and see what’s going on with the state of the cabin’s summit. Something like the Escape Log Cabin is a fine place to start! When it comes to doors, your choice is going to boil down to single or double door mechanisms. The former is going to make for an enclosed, private structure that’ll suit a home office, study room or kids hideaway, while a double door build will let in more natural light, along with a gentle breeze if you leave it open and it’ll also feel a bit more stately and grand. In addition, a dining cabin will be far better with two doors instead of one – you don’t want to be banging your elbow and precarious foodstuffs against an entrance that’s too small. Windows – what’s the clearest pick? As we’ve already said, these log cabins aren’t really designed as a run-of-the-mill, kooky playhouse for the kids. They have more in common with a real, fully-fledged abode than most garden centrepieces on the market, and this includes the quality of their windows. Our cabins have either a single or double-glazed glass installation. Single-paned windows are cheaper, lowering the cost of the overall purchase by a fraction, but they won’t retain heat half as well as their double-glazed equivalent. Autumnal and winter use will be cosier, in general, with such a commodity, and limit the amount of condensation that can pool on the pane. Yet buyers hoping to make use of the cabin (primarily) in the summer months might prefer a single-glazed window, precisely because it doesn’t conserve warmth. These windows cater for a cooler vibe when the sun’s bearing down on your lawn. Our advise is get the double glazed option for all year round use and then simply open the doors and windows in summer! You’ve come with us so far – it’s about time we got to the really scintillating stuff, the characteristics that make these cabins an absolute treasure! What do we mean, exactly? Well, how about a bonafide veranda jutting from the head of the door? 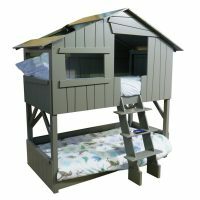 It’ll protect anyone on the stoop from spots of drizzle, and lends a shaded area out of the main cabin for kids to sit and watch the bees, birds and butterflies flutter by. 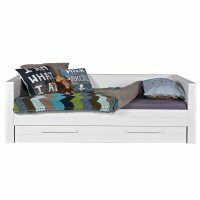 There’s also the possibility of a specialised storage nook for your tools and cushioning. 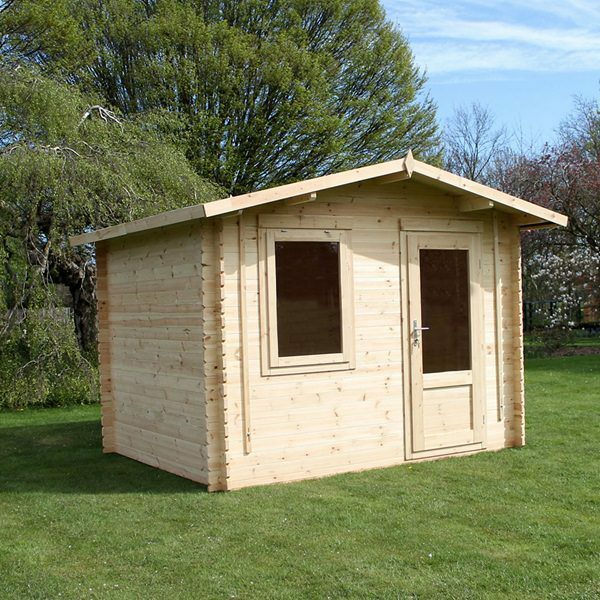 Again, the Delamere Cabin rises to the challenge, as it comes with a shed space on the right side of the structure. It has its own door, with a handle finished to the standards of our other cabin entrances. Nice! 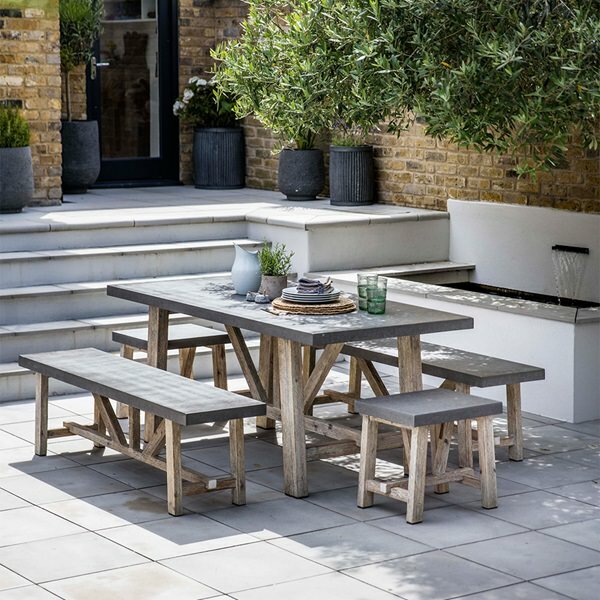 Finally, we thought it’d be remiss of us not to remind you of the safety elements that our designers, Mercia Garden Products, have employed with gusto…. Every cabin – even a large, window-prolific model like the Grizedale Garden Room – has protective glass in the pane fittings. It’s very hard to smash, but if that ever happens, it’s fashioned to break into blunt, harmless pieces- minimising cuts and grazes. Doors can be locked too – you’ll receive a key with your cabin kit. And in terms of safeguarding your purchase from harsh weather and decay, we’ve chucked in a 10-year anti-rot guarantee, providing you treat the timber with the appropriate products (we can recommend a few) every 12 months. Remember that every log cabin you see here doesn’t come fully constructed. Can you imagine the transport costs if it did? But we can certainly help you in the setup process. We have a super friendly and professional installation team on the ready with a packed lunch, tools and cameras (they’ll take pics of their handiwork unless of course you don’t want them too!). 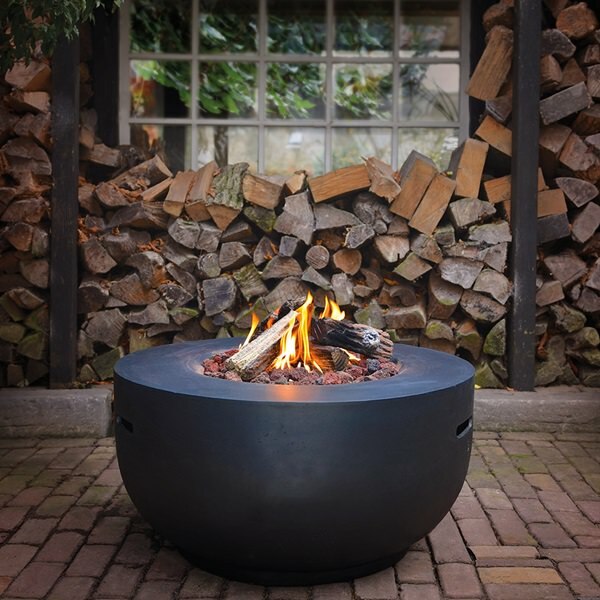 These examples above are only a tiny smattering of what we have on offer so feel free to call us – we really want to learn all about your outdoor space and how we can help you maximise every single hour of summer time in your garden or patio with a chic, multifunctional log cabin (we still can’t believe we’re able to say that…). Call us on +44 (0) 1305 231231 or email customerservice@cuckooland.com with any questions you have no matter how big or small- our little garden Gnomes are waiting.